Kidnapped at Old Times font is decorative font which is designed by Intellecta Design. This font is labeled as Initials font. 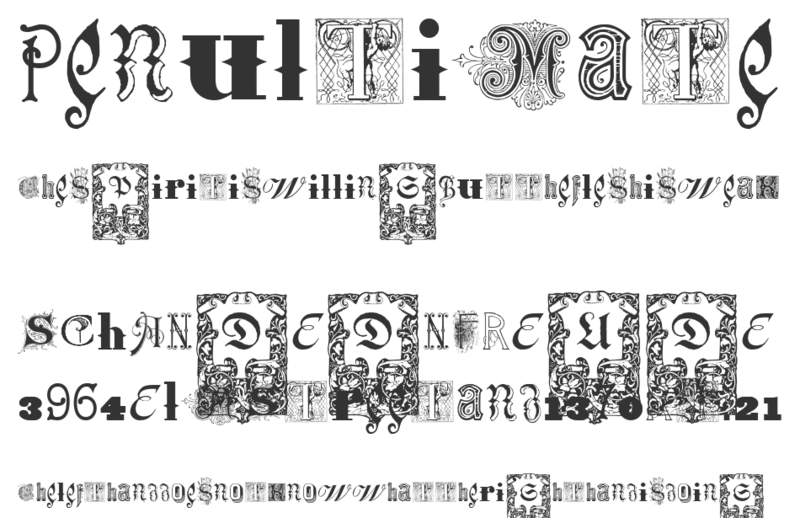 Kidnapped at Old Times font family has 4 variant. Kidnapped at Old Times Free, by Intellecta Design This is a special free version to demonstrate the goodies of the Kidnapped Collection. Kidnapped are 21 fonts (and growing up) of some of the most decorative caps we have ever carried. Decorative caps can capture the attention of anyone when used well. These caps are remarkably interesting and very detailed. So many to choose from. Easier to just order the whole family! Intellecta Design is a Brazilian type foundry interested in typographical research and revivals of all forms of ancient typefaces and handwriting styles. It searches historical churches, museums and similar institutions to develop handwriting and other fonts from old documents. 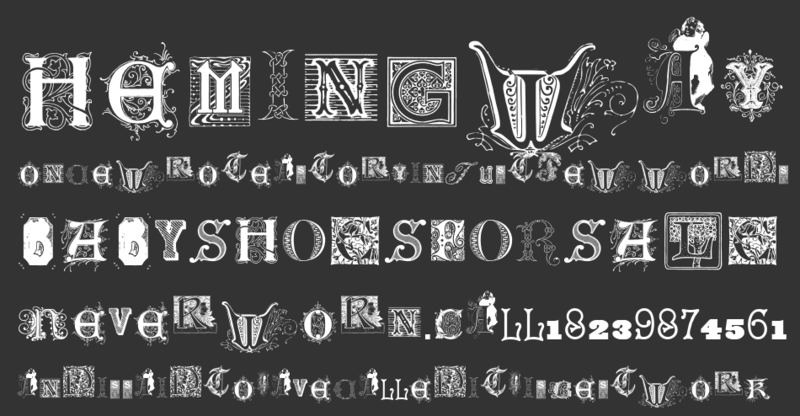 To purchase the complete Kidnapped at Old Times collection (21 different font sets and over 1000 different, exotical and intrincated letters) and commercial licences, please, visit: http://new.myfonts.com/fonts/intellecta/kidnaped-at-old-times/ Visit my commercial library : http://new.myfonts.com/foundry/Intellecta_Design/ Donations are appreciated! Kidnapped At Old Times Free font is one of Kidnapped at Old Times font variant which has Regular style. This font come in ttf format and support 0 glyphs. Based on font metric, Kidnapped At Old Times Free Regular has usweight 400, width 5, and italic angle 0. This font is labeled as . Kidnapped At Old Times Free Two font is one of Kidnapped at Old Times font variant which has Regular style. This font come in ttf format and support 0 glyphs. Based on font metric, Kidnapped At Old Times Free Two Regular has usweight 400, width 5, and italic angle 0. This font is labeled as . Kidnapped At Old Times Free 3 font is one of Kidnapped at Old Times font variant which has Regular style. This font come in ttf format and support 0 glyphs. Based on font metric, Kidnapped At Old Times Free 3 Regular has usweight 400, width 5, and italic angle 0. This font is labeled as . Kidnapped At Old Times Free 4 font is one of Kidnapped at Old Times font variant which has Regular style. This font come in ttf format and support 0 glyphs. Based on font metric, Kidnapped At Old Times Free 4 Regular has usweight 400, width 5, and italic angle 0. This font is labeled as . COOLECTOR Copyright (c) 2009 By Billy Argel. All Rights Reserved.